Stay at the Courtyard by Marriott Houston Westchase! 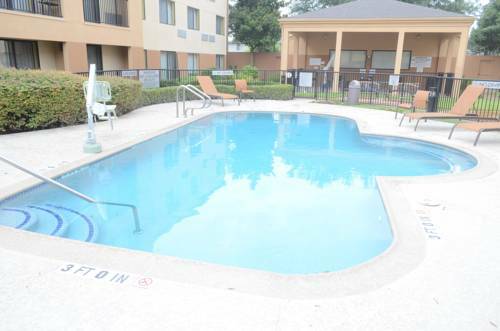 The Hotel is located in the heart of Houston's prestigious Westchase District off Westheimer and the Sam Houston Tollway. Our smoke free hotel is just south of Houston's Energy Corridor and City Centre nightlife and Restaurants! Also home to many major corporations such as Emerson, Phillips 66, Cameron, Chevron, C&J Energy, Jacobs Engineering, NOV, Bentley Systems, URS, CVS, Randalls / Safeway, ABB, JGC, Siemens and many more! For our leisure travelers, we are ideally situated between Houston's famed Galleria Shopping Mall and Houston's new hip and trendy CityCentre which is full of Upscale Boutiques and Restaurants. Come enjoy and relax poolside in our gorgeous courtyard or wind down with your coworkers in our Bistro, open for breakfast and dinner, featuring a full bar. Make room for a little fun.